Join the ABA and have some fun. 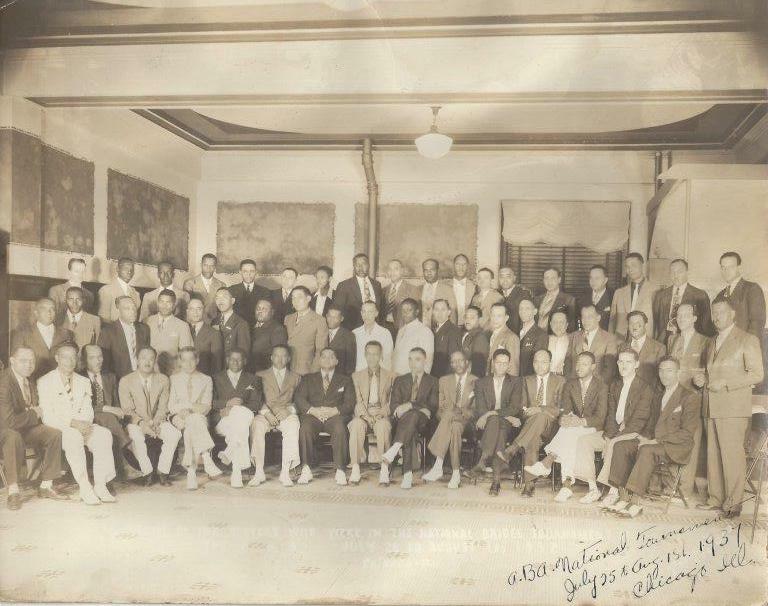 The American Bridge Association (ABA) was formed in 1932 by black tennis players at Buckroe Beach, Virginia. During this time blacks were excluded from most bridge events. The desire to compete in the sport of tennis, despite the racial barriers of the time, resulted in the creation of the American Tennis Association in 1916. The Association often held its matches on college campuses such as Hampton Institute, now Hampton University, and Lincoln University, where adequate facilities were available. One such championship event was held at Hampton in 1932. At the conclusion of the tournament, a group of tennis players, who were also bridge enthusiasts, suggested having a duplicate bridge match in the evening as a form of relaxation. This event, coupled with impetus from the Cromwell School of Contract Bridge in New York City, marked the beginning of the American Bridge Association(ABA). Dr. M.E. DuBisette became the first president of the ABA. The first National Bridge Tournament was held in Buckroe Beach, Virginia in 1933. Growth was imminent for the newly formed organization. In 1936, the ABA merged with the Eastern Bridge League, a group of New York City bridge clubs. Since this time the ABA has evolved into eight sections - Eastern, Great Lakes, Mid-Atlantic, Southern, Southwestern, Midwestern, Western, and Northwestern. As the ABA continued to grow, attention focused on the need for a permanent home. The goal of a permanent location was accomplished in 1994 when a building, which now houses ABA memorabilia and the ABA National Headquarters , was purchased in Atlanta, Georgia. In the 1980s, the American Bridge Association had selected the Schomburg Center in New York City to officially house its memorabilia. Currently the ABA National Headquarters showcases artifacts and catalogs ABA documents. In 2005, the American Bridge Association published Defining Moments, an historical package which includes a written chronicle, a DVD of oral history, and playing cards. These components depict the movements, forces, and people who helped shape the history of the ABA. The entire package or any of its components may be obtained from the National Headquarters in Atlanta, Georgia. 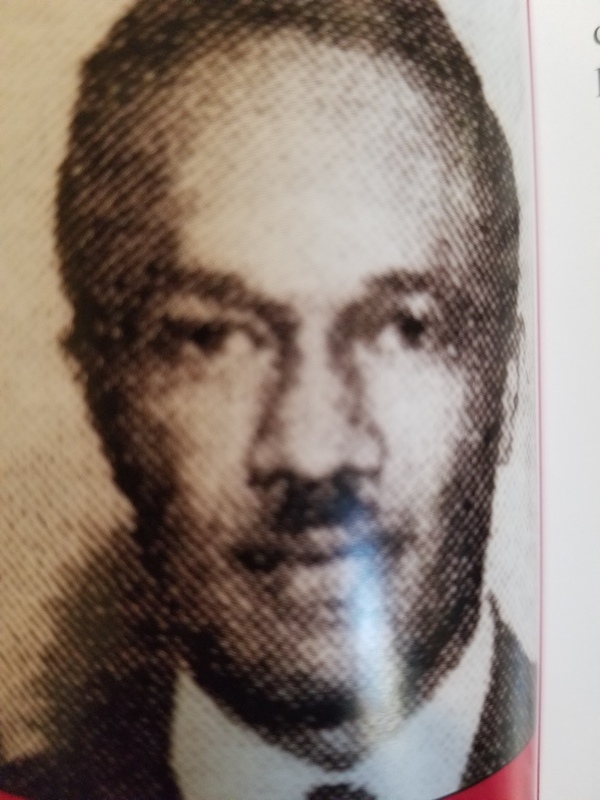 The entire package or its components may be obtained from the ABA National Headquarters in Atlanta, Georgia.In 1967, the American Contract Bridge League (ACBL) removed the final obstacle to ACBL membership for African-Americans when it included in its by-laws that no person shall be denied membership because of race, color, or creed.Historically, many states, particularly in the South, had laws that made card-playing between blacks and whites illegal.. Some of those were:  Texas,  Tennessee,  Mississippi,, Alabama,  and Huntsville, Alabama. The ABA remains a predominantly, but not exclusively, black organization. It holds two national tournaments each year. The ABA has its own masterpoints system—similar to but different from the ACBL masterpoints system. The first President, Dr. M.E. 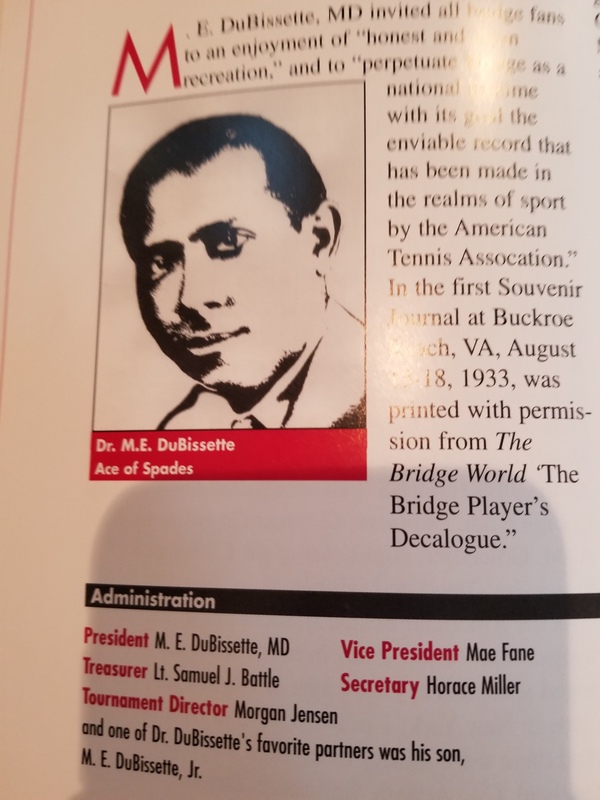 DuBissette, (1933-1934) invited fans to an enjoyment of "honest and clean recreation, and to perpetuate Bridge as a National pastime with its goal the enviable record that has been made in the realms of sport by the American Tennis Association." In the first Souvenir Journal at Buckroe Beach, VA August 15th-18th, 1933, this quote was printed with permission from The Bridge World "The Bridge Players Decalogue. 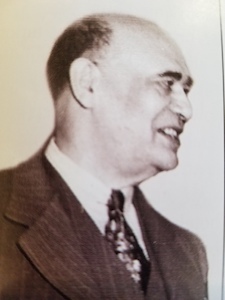 Horace R. Miller -1935-1936. The ABA owed its flourish to the Cromwell School of Bridge in New York City- under the Administration of Horace R. Miller. It orchestrated the merger with the Eastern Bridge League, a group of New York City Clubs, led by Morgan S. Jensen and such notables as Chairman of the Rating Committee and Executive Secretary, Arthur Curiel; Chairman of the Executive Board, Faustine Gregoire; First Editors of the ABA Bulletin, Egar T.Rouzeau and William R. Tatum." According to J. Herbert Kerr of Cleveland, OH,"...This is the old guard, the pioneers, an epic of human progress..."
Dr. E.T. Belsaw The administration of E.T.Belsaw of Mobile, AL, lasted thirteen years (1936-1949), and it was during his tenure that the basic structure of the Association - organization, procedures, policies and administration- took shape, including the rotational principle of the annual convention in various cities, the master point schedule of rating competing players, the ABA Bulletin, the structural relationships of clubs and units, the sectional divisions of the Association(each headed by a Section Vice-President), the various levels of tournaments, and the spread of membership across the country. As the ABA continued to grow, attention focused on the need for a permanent home. The goal of a permanent location was accomplished in 1994 when a building, which now houses ABA memorabilia and the ABA National Headquarters, was purchased in Atlanta, Georgia. In the 1980s, the American Bridge Association had selected the Schomburg Center in New York City to officially house its memorabilia. In 2005, the American Bridge Association published Defining Moments, a historical package which includes a written chronicle, a DVD of oral history, and playing cards. These components depict the movements, forces, and people who helped shape the history of the ABA. The entire package or any of its components may be obtained from the ABA National Headquarters in Atlanta, Georgia. 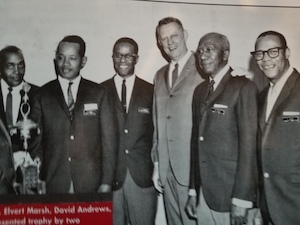 In 1967 the American Contract Bridge League (ACBL) removed the obstacle to ACBL membership for African-Americans when it included in its by-laws that no person shall be denied membership because of race, color, or creed. Historically, many states, particularly in the South, had laws that made card-playing between blacks and whites illegal. Some of those were:  Texas,  Tennessee,  Mississippi and  Alabama The ABA remains a predominantly, but not exclusively, black organization. It holds two national tournaments each year. The ABA has its own masterpoints system—similar to but different from the ACBL masterpoints system. ABA MISSION STATEMENT The members of the American Bridge Association are committed to fostering an environment that stimulates competitive Duplicate Bridge card play, while respecting the basic worth of each participant at every level of performance. WE ARE COMMITTED TO recruiting and retaining members of the ABA through a diverse agenda of educational programs and a comprehensive slate of games. Officers and members of the ABA are also dedicated to encouraging individual members to upgrade their playing skills and performing at maximum potential, while providing challenging bridge games in an atmosphere of respect, tolerance, courtesy, kindness and friendship. Promoting, protecting and advocating a spirit of goodwill and positive interaction with local communities is a continuous goal. We recognize that our efforts are not terminal and therefore pledge our commitment to the ongoing task of optimum settings for the play of Duplicate Bridge. The American Bridge Association is committed to fostering an environment that stimulates competitive Duplicate Bridge card play, while respecting the basic worth of each participant, at every level of performance. WE ARE COMMITTED TO recruiting and retaining members of the ABA through a diverse agenda of educational programs and a comprehensive slate of games. Officers and members of the ABA are also dedicated to encouraging individual members to upgrade their playing skills and performing at maximum potential, while providing challenging bridge games in an atmosphere of respect, tolerance, courtesy, kindness and friendship. Promoting, protecting and advocating a spirit of goodwill and positive interaction with local communities is a continuous goal. We recognize that our efforts are not terminal and therefore pledge our commitment to the ongoing task of optimum settings for the play of Duplicate Bridge.